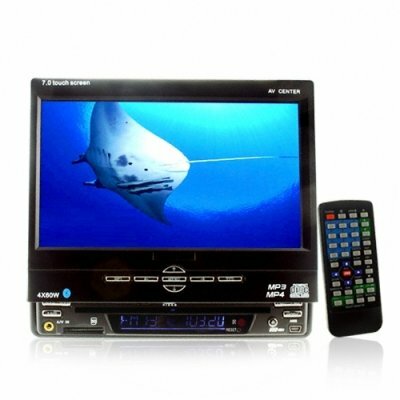 Successfully Added Car In-Dash DVD AV Center- 7 inch TFT DVD - TV + Bluetooth to your Shopping Cart. The quick easy way to get everything you need into your vehicle is with this stylish unit featuring a 7 inch TFT LCD screen, DVD, MPEG 4 playback, TV tuner and bluetooth. A simple install is achievable with the included instructions and then the intuitive touchscreen control system will amaze you with it's response, allowing you to quickly navigate the head unit's features. Bluetooth is also included to allow handsfree calls from your bluetooth capable mobile phone. Expandability is provided by way of USB and SD card if you run out of discs and a full capability remote control rounds off this excellent package, finally a head unit that does it all. Available now direct to you from China, with Chinavasion's excellent wholesale prices and shipping options..
Multi-Function Front Panel LCD for Radio, Time information etc.